Yesterday Instagram went one for about one hot minute. Ok, it was a little longer than that. It was more like just under an hour. However, the panic that ensued was monumental. All of the sudden everyone and their grandmother was back on Twitter. People wanted to know what the problem was. Were they alone in their Instagram outage? While Twitter worked to release the news and let people know that Instagram was officially down, it was a mere moments before #instagramnotworking was trending on Twitter. And the wonderful thing about this hashtag is the fabulous humor that came with it. We kid you not, the highlight of our social week came via this beautiful hashtag. 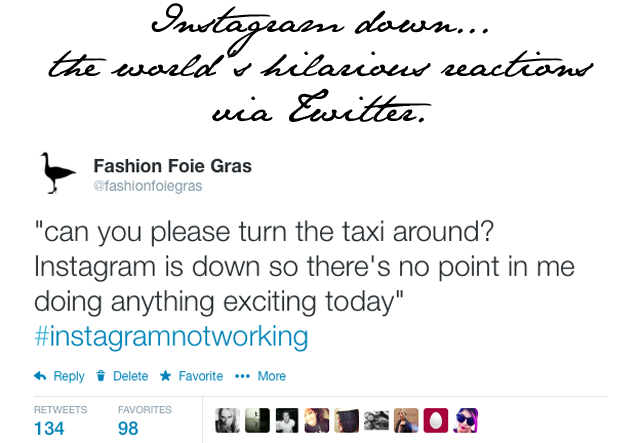 A good hour was spent scrolling through the hilarious reactions to the Instagram outage. In the end, it seemed wrong to keep all fabulous jokes to ourselves. We're just as addicted to Instagram as anyone else so these little tidbits truly struck a chord. #instagramnotworking Cant prove how much fun we had last night, how carefree and flirty we are, i hate myself I have no real friends.